Dry eyes are common problem for most of us nowadays. You may experience dry eyes in situations where there is a lot of dust, in an air conditioned room, or if there is too much of heat etc. 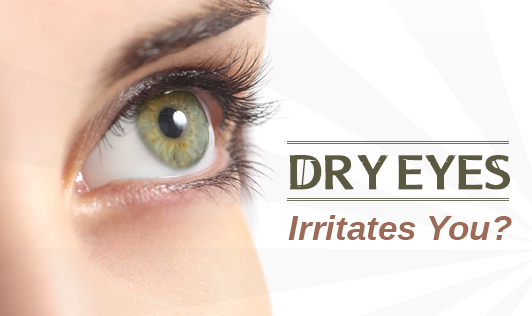 Irritation will be the first symptom of dry eyes. Others are sensitivity to light, problem in wearing contact lenses, sometimes blurred vision, in rare cases there will be a pain in the eyes. In such situations have your doctor's number with you for immediate medical care. The main cause of dry eyes is lack of tears. Tears are the combinations of proteins, fatty oils and electrolytes. Tears are necessary for the normal lubrication of your eyes and to wash away particles and foreign bodies. For some of them dry eyes will be caused when there is imbalance in the composition of the tears. Decreased tear production will be due to many reasons like an eye surgery, tear in any nerve tissue, history of an eye injury, if on cold or allergy medicine, aging etc. Stop smoking if you are a smoker. Give rest to your eyes. Blink your eyes at frequent intervals. Cool your eyes by placing cucumber on your eye lids. Avoid using cold and allergy medications as far as possible. Relax your eyes by keeping it closed for some time. You may be advised to use special contact lenses to reduce dryness. Consult your doctor who can advise you for the same. Place Aloe Vera pulp on your eyelid to avoid irritation and cool down your eyes. Make sure that the Aloe Vera content doesn’t enter the eyes though. Because of irritation in the eyes, dark circles and puffiness around your eyes may increase. Doctor might advice you to go for eye drops depending on your condition. Dry eyes can't be cured but the symptoms can be alleviated by following these tips. Consult your ophthalmologist to know more about dry eyes and the remedy for it.